NYT Cooking: The word “buttery” in the title refers to croissants, which make an especially rich foundation for this golden-topped baked breakfast classic. Toasting the croissants before building the casserole adds caramelized notes that can stand up to the bits of browned sausage, sage and melted Gruyère strewn throughout. 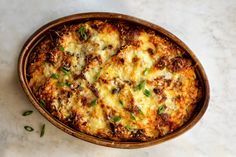 Make this the night before a special breakfast or brunch, then pop it in the oven an hour before you plan to serve it.